I've just had to replace my hot water system and computer printer. I also noticed the exterior of my house is suddenly looking really shabby,with exposed lining boards in places.I'm considering painting some of it myself to save money, but aware that I'm just one person trying to manage home, garden, major renovations, a business, and two kids! And then there are all of the little replacements that add up - the umbrellas for school, crockery that's broken, towels ready for the rag bag etc…. 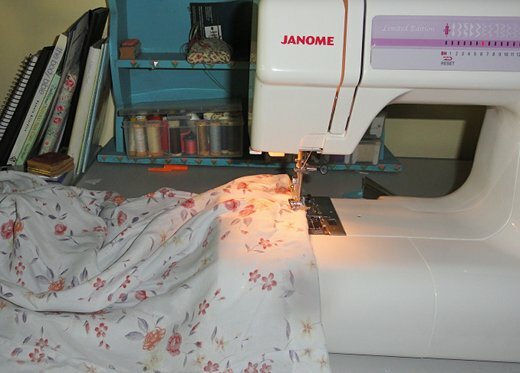 When my very old sewing machine gave up a few years ago, I replaced it with a Janome Quilters Companion I bought on eBay for a fraction of the new price. It's still going strong and has worked perfectly since I bought it. I've written in the past about the common sense option of building an emergency fund for unusual and unexpected expenses. Everyone has these expenses as some point - the dog will have to go to the vet, someone is sick and needs special treatment, the fridge breaks down or some other appliance you need has to be replaced in a hurry. Those expenses are best covered with an emergency fund. The fund is kept in a bank - we use the ING online bank because their interest rates are better than the local banks. You may not need to dip into this for a couple of years and when it reaches a certain level - say $1000 - $2000 - you stop paying into it. It can sit there earning interest until you need it. Don't be tempted to keep your emergency fund at home in cash. You'll be tempted to dip into it and many of us would give in to that temptation. 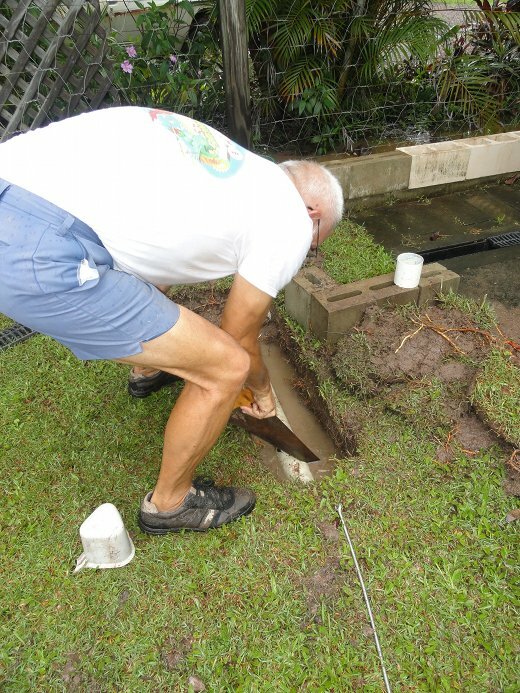 Hanno doing repairs to the drains in the backyard during the recent flooding rains. 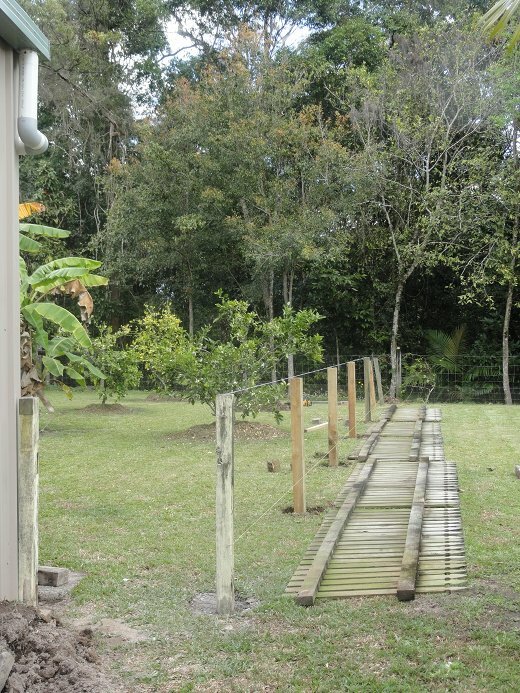 Moving, replacing and repairing fences is a fairly frequent task here. We put aside a certain amount every month for home maintenace. That covers house painting - we have a brick house so it's only interior painting, guttering, roof repairs, fencing etc. We are lucky in that Hanno can do most of our maintenance and repairs and when he does he often uses recycled materials. Hanno never throws away nails, screws, washers, paint, timber, wire, roofing iron, steel reinforcement or anything that he thinks will be useful in the future. Luckily we have a large shed to store these thing in and having that stash of recyclables saves us a lot of money. One of the many things that impresses me about Hanno is that he is always checking things to see if they're working and in a good state of repair. If he finds anything broken or damaged, he will fix it immediately. He never lets it get worse. Get into the habit of checking around your home and do your maintenance promptly so it doesn't turn into a repair job. If you need to replace or repair anything, look at buying from renovation yards and compare prices between buying new materials from the hardware store and recycled pieces from the dump shop or renovator's store. Make sure you not only compare price, compare quality too so you get the best value for money. Madeline, if you have to pay to have your repairs done, if you source the materials, that will save on those repairs. We put money aside every month for car registration, maintenance and repairs too. Check your sheets and towels when you fold them after washing. Replacing household linens is best done at the post Christmas sales. Inside the house, we only replace things like sheets and towels when they're absolutely beyond repair. 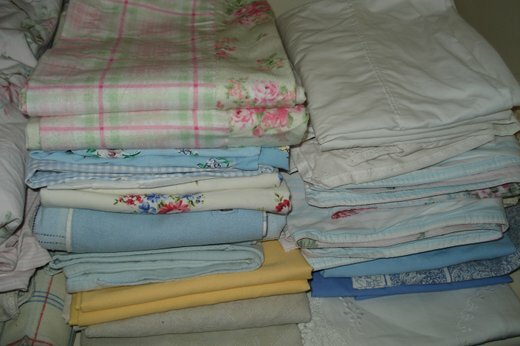 I keep a lookout for frayed or ripped sheets, and repair them to keep them going another season, generally I get another two seasons from them and then the sheet or towel will be used for cleaning rags or patchwork, it won't be "thrown away". I only ever buy sheets and towels when I see them at a good price, usually at the post Christmas sales. If I don't see the quality I want at the price I'm prepared to pay, I don't buy it and we make do until I see something I'm prepared to replace it with. I don't want to waste money and I don't want inferior quality. If I can buy best quality as a reduced sale price, I know that it will last many years, it will be a pleasure to use and I haven't spent too much on the replacement. I am prepared to wait for that. If I were to replace crockery, glasses, pyrex or cutlery, I'd do it at a good sale too, and make sure I got the best quality I could afford. Second hand shops are also a great place to look for kitchen replacements. Naturally everything will be pre-used but they'll be clean and in good repair and usually the older items haven't been made in China or India and will be good quality. Taking a regular stroll through your local second hand shop is a good habit to get into because you never know what you'll find there. 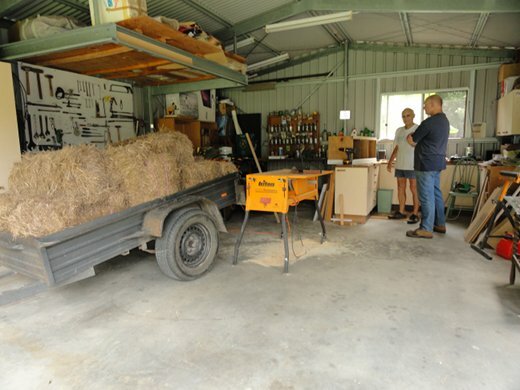 Hanno with his son Jens in his workshop/shed. In there he keeps all the bits and pieces he saves that he thinks might be needed for future repairs. For odds and ends like umbrellas, sports equipment, camping gear and bags, the obvious place to look is the closest lost property sale. Here is a link with a catalogue showing what is available here in Australia but I'm sure most countries would have similar lost property sales. These auctions happen all over the country, you may find one near you. Go well before the auction starts because you should inspect what you intend to buy. You won't get your money back if you're not satisfied. Goods bought at an auction are generally bought "as is". When you're doing this kind of shopping, don't go overboard and load yourself up with too much. Keep your simple life values in mind and remember what your level of "enough" is. All you're looking for is good value and good quality and if you can get that you've done a good job. So to recap, if you can, and I know not everyone can do this, save an amount for emergencies. Put aside a certain amount each month for ongoing house repairs and maintenance and car repairs and maintenance. To work out what that amount is, go back and look at what you've paid in previous years and if you think that is a typical yearly amount, divide it by 12 to get a monthly amount, or by 52 to get a weekly amount, and that is what you'll have to put aside. 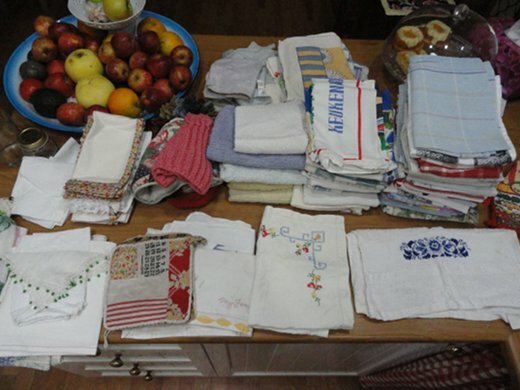 If you get to the end of the year and you haven't spent the money you set aside, use it on building up a stockpile of a small number of sheets, towels, glasses, crockery, underwear, socks, work clothes, children's clothes in sizes they'll grow in to. Once you have enough of these things in your stockpile, any excess money can go to your emergency fund or straight to savings. 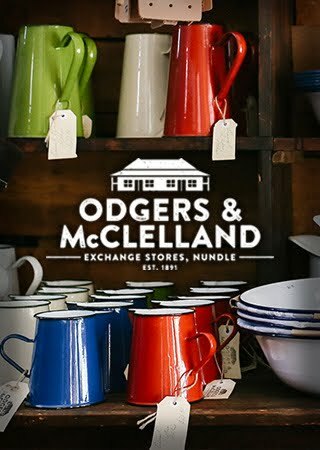 Take advantage of sales, second hand and auctions - either local or online and be prepared to step back and wait if what you need is not at the right price or is an inferior quality. It's okay to wait for exactly what you want. That is wise economy. Please add your thoughts here so this pool of ideas can help Madeline and others who are changing how they live. 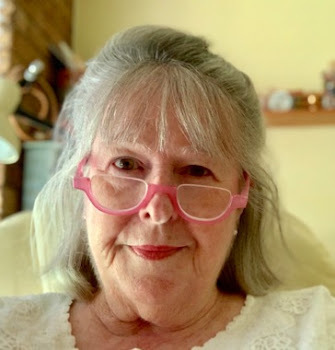 ADDITION: I forgot to tell you that I'll be interviewed live on Radio National's Life Matters today at 8.45 am Queensland time and 9.45 am AEDT. The program will be available later in the day as a podcast. I'm a new follower and learning so much. You went shopping with me in Fort Worth, Texas, yesterday. Until I read your posts on stocking up I add no clue on how much really 'stocking up' was. I've set aside an amount to spend each time I shop to fill my storage pantry. My husband and I are turning a hall closet into our storage pantry - complete with list on the door (inside). Baby steps, but we all have to start somewhere. Thank you. Thanks for your post - I hadn't thought to put money aside for house maintenance - we have an emergency fund, save for the car and specific house maintenance, but it would make things so much easier to save for routine home maintenance too! Thanks. One day, it would be great if you could share a post on how to mend sheets, ours are tearing because they are threadbare and I have no idea how to repair them, they may be beyond it. I looked for sheets in the sales this year, but the quality ones were a little beyond our price range at the moment - something else I should save regularly for! Thanks for the idea to do that. Just a note to Madeline. Do not assume that it will be cheaper for you to do the paint job than to get in a professional. Get your quotes even if you are just saving to get your house painted. So you know what you are up for. I went to our local bunnings for a " how to polish your own floorboards" class I then figured out how much it was to hire the equipment. I then got 2 quotes they were both cheaper than me just hiring and buying the estapol. That was not including my very amatuer work/time. Our house was painted last time at a cost that we could not have even bought the paint for let alone hired the tressles and such. I have a girlfriend who is a single mum.. We live in an area with many retirees. Whenever friend needs a fix it job done on her house she puts a card up on the community board at the local supermarket. Everytime some semi retired builder- handy man has answered her card. She has had her steps replaced, her kitchen properly fitted, her shower stall rewaterproofed. All at a good price . The fellows just work a bit more slowly but they figure out the cost before they even start so she knows what she is up for. It is a good idea. thanks for a wonderful and thoughtful answer as usual. I hadn't heard of lost property sales - what a great idea. I'm envious seeing Hanno's shed as I have neither shed nor garage. I do think that should be the next thing I save for, so I can store chairs etc...that I haven't gotten around to repairing.I'd also like to keep my new 'utility room' for laundry, stockpiling etc.., not tools and bales of hay! Your idea of making do for another year if the sales aren't good enough impressed me. Sometimes, because of work/time pressure I go ahead and buy what we need instead of waiting - no more! I have found that many people are more than willing to share whatever they have a surplus of. A simple mention of "I really need some full sheets (or juice glasses, or whatever...) often results in a gift of the needed item. Of course it may not be the exact color or style you would choose for yourself -- but it saves you money and gives the other person a bit more space! Can I just add that it is wise to be careful when doing repairs and renovations yourself as sometimes you may not be aware what you are dealing with... asbestos and lead paint being two things in particular to look out for - a lot of pre 1990's houses may contain asbestos and it can be under the kitchen lino, under the carpet, the external and internal walls, around pipes etc (be especially cautious in homes built in the 50's-70's)- a bit of research before hand can save a lot of worry later. When sheets get worn cut them down the centre and then sew them back with the less worn edges in the middle, they will last quite a while after this. The local charity shops will often have sheets, towels, crockery and cutlery etc, just keep looking regularly,till you find what you want. Finally," Gumtree" is an Australian site that has EVERYTHING at below retail or second hand....well worth a look. Good luck everyone in keeping it simple. I, too, would love a post or two on mending: sheets, shirts, etc. I can mend a bit, but do not know much about sewing and mending and really want to learn to do that to make things last longer. Thanks Rhonda, for all you teach us. These are some fantastic ideas ) :) My income is really so limited that it's hard to save for our family right now. However, when we do have to buy things, we always looks at yard sales/garage sales/thrift stores. WE've found some wonderful things at really fantastic prices. There's a saying I heard from an old timer in our town - "Poor people pay twice". It has stuck with me over the years, probably because I notice how often it's true. When you don't have enough money to buy good quality in the first place, when you try to stop the gap by buying cheap, poor quality, Chinese made goods, you pay twice. When you don't have a big income, it's often not easy to do. But what he taught me was to hang out if at all possible till I could afford to buy something that will last, then maintain it. And Rhonda, you're right - you often do find better quality buying second hand at op shops and garage sales. 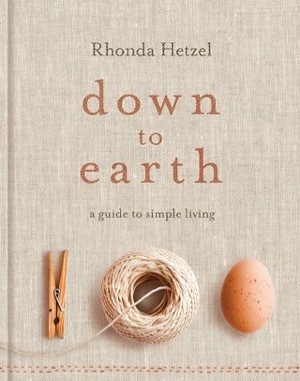 Hi Rhonda, just heard the interview with Life Matters - lovely and very inspiring. Thank You. Great post and I've had an emergency fund for years. @ Melissa - my grandmother used to cut her sheets in half straight up the middle(lengthways) trim the hems off the existing outside then sew those outsides of each half together so there was a seam up the middle of the sheets, making a new centre, then she'd hem the 'new' outside edges. Of course she didn't wait until they were too worn to do this and it usually gave her a couple of extra years out of them. All sheets were 100% cotton then. Try op shopping some pre-loved sets as I can buy a good set of double sheets with pillow slips for around $8 and you can still find 100% cotton sometimes and they last better. Might give you another year to save up for a good set on sale! I must add as well that Freecycle is an astounding resource for nearly every need in the home. 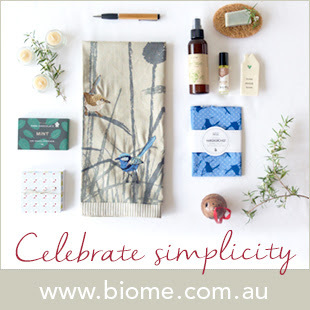 We are careful to not only ask for items we need, but also to give away usable items we no longer need. Anything from small and large appliances, clothing, furniture, tools, linens, bikes, etc. can be sourced on freecycle. Additionally, the FREE column of the newspaper or online buy/sell listings is also a great place to source things you need if you are NOT in a hurry to replace something. I agree about charity shops... just this week, I purchased a much needed 100% cotton bed blanket to replace a very shabby one. It was in nearly new condition for $6.00 - a good investment as it's sure to last as long as it's predecessor (20 years). Thanks for a great post! Great post! I think it is important to itemize your bills and actual expenditures AND save for a rainy day. I had no idea what money was coming in or going out until I met my now husband. It's amazing how much you can save if you know how much you might be wasting. If you have a friend that frequents garage sales its worth asking them to be on the lookout for what you require and let them know what you are willing to pay. My friend has me on the lookout for a bread maker for her as she knows my Panasonic cost me just $5 at a garage sale. She's prepared to wait until I find her a Panasonic. Apparently, they don't make them anymore. Estate sales are good for finding household items. Most of my small appliances came from garage sales. I always ask to plug them in and most people are happy to let you do this so you know that it still works. I recently found a Sunbeam Mixmaster brand new never been used still in the box for $10. An older model but my friend says she has had hers for 20 years! On buying quality linen - sometimes motels have closing down sales. I bought my son a new Sanderson quilt cover for $5. They were all in the same design but being snapped up. When I do replace now I'm looking for better quality than what I used to purchase. Online I found 1000 thread count cotton sheet sets for not much more than the chain stores were selling 250 count thread sets. What a difference those increased threads make to the quality. It's something I never used to consider. A very timely post again. I was just thinking about starting a new thread on the forum regarding stock piling clothes. This is the first time I've posted a comment, and I've been a lurker for a few years now (I don't have my own blog so didn't take part in the 'what I'm thinking about Fridays')but I just had to say how wonderful it was to hear you being interviewed on the radio! I love the internet!!! I am currently unemployed, so finding your posts even more useful than ever, and an inspiration to live a more frugal life. Pretty much all our household stuff comes from charity shops etc, and clothes too! It's amazing what you can find. I've not tried cutting sheets in half (ours are mostly fitted ones), but I am in the (slow!) process of repairing small tears in the mattress. Couldn't agree more with this post Rhonda. It takes a while to get yourself to a point where you can afford to buy good quality, but the length of time the items last make it more than worthwhile to wait and save. I have a set of egyptian cotton towels which are still going strong 10 years after I bought them. No holes, rips or tears and they still hold a degree of fluffiness that makes them lovely to snuggle into. One more thing: Check to see if your city has an environmental drop off place like mine. Here you can leave cleaners and paints - all kinds of chemicals that you no longer need. Also, just by showing proof of residency (drivers license or water bill) you can pick up a can or two of free paint - of course it may not be the exact shade you're looking for but it might be. I'm repainting our garage using free paint. It's pretty exciting. They will also let you take a cleaner or two. Thank you Rhonda for this great post. Old towels, if cut into squares and overlocked around the edges, make great face cloths and even can be used instead of oven mitts. We live on a tight budget, but most months I manage to set aside something for emergencies. Old sheets are also great cut up and used as straining cloths for making cream cheese from yoghurt and straining juice from fruit pulp for jelly making. Please will you post a link to the podcast you mentioned. i would love to hear it, but have no idea where to find it. Great ideas! We have a store here where everything is donated and worked by volunteers. The proceeds all go to an abused women and children's shelter. Because it's such a wonderful charity, people will donate very nice quality items. 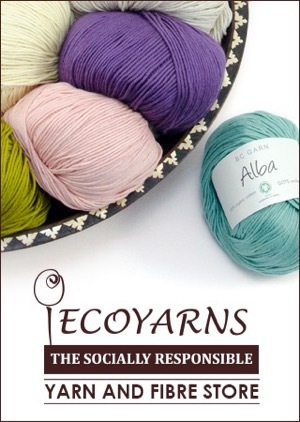 It's a great place to purchase quality used clothes, household items, books and even yarn. Hi Rhonda, I apologize if this message reaches you twice...I thought I lost it the first time. This is a very timely post, indeed, as I just found a new book by Kristin M. Roach entitled, "Mend It Better Creative Patching, Darning, and Stitching". The book has chapters on repairing, darning, patchwork, seam fixes, zippers, etc. There are also a template and directions for a great little Mending Tool Clutch for keeping all the tools for mending in one place - really handy idea. This is a good beginner's book with simple instructions, but I've also found a lot of helpful information for those who have been repairing and mending for a while now. I highly recommend it. I use the blind man's stitch (by hand) to repair small tears in my sheets and duvet cover. The old saying, "a stitch in time saves nine" is really true! Hanging your sheets and bedding on a clothesline to dry helps them to last much longer, too. Right now I am darning old wool socks because once the heels and toes are repaired, the socks will feel like new. The rest of the sock looks likenew and they'll last for years. It's harder to find good quality wool socks now, and they've gotten expensive! So true about the home repairs and maintenance. Many single women struggle to pay their property taxes and home repairs. I am starting to do the easy things myself: painting the fence, figuring out what's wrong with the sewing machine, etc...Also, if you qualify, the gas and electric companies will often replace your old appliances free of charge! They do excellent work, and pay for the permits, too! Once I got into the swing with a food stockpile, that freed up the money I needed for an emergency fund. use a piece of older similar fabric and patch a hole; rips can be reinforced with fabric tape and zig-zagged together. 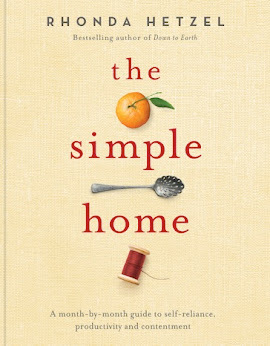 These are my thoughts on keeping household linens in good shape. We keep a certain amount in our emergency fund just for car repairs, since we decided we will not buy a new car but just keep fixing our old car. We have saved thousands of dollars that way not needing to take out a car loan! Just wanted to say thanks for all the tips on sheet mending. Socks I can darn, shirts I can repair, but it never occured to me to do anything but cut old sheets up and use them for other purposes. I had something I wanted to add to this. It is a very good example of poor economy. We had friends over on the weekend who are in financial difficulty. One of the things that was contributing to their debt was buying and then trading in three new cars in the last five years. None of the cars cost more than $30,000 but they owe over $70,000 in repayments. We were so horrified by this. We have a cheap old 20 year old ute that runs on the smell of an oily rag and a 10 year old sedan that we bought new and will continue to be a good car for another 10 years because we have well looked after it. I noticed in my children's school parking lot that at least half the cars are the new or previous model and it makes me wonder just how many people are caught in the trap of constantly trading up their cars. Scary stuff. Buy good quality and then use it until you can't use it anymore. Have a great weekend, I am looking forward to listening to your podcast this morning. very nice and simple post.. Thank you, Rhonda, for another sensible, reasonable and reassuring post. Delightful and inspiring. To help with getting linen to last and for cleaning purposes as well, I now only buy white linen. That means that I don't have to worry about matching and if they get extra dirty they can be soaked in something a little stronger without worrying about losing the colour. Also I find that white linen also seems to look "cleaner". Wonderful items from you, man. I have be aware your stuff previous to and you are just too excellent.